It is evident that the more sales channels you work with, the more chances to increase sales you get. The easiest way to get new channels is often achieved with Magento affiliates. Meet the Amasty Magento 2 affiliate extension – a tool that allows running Magento 2 multi-level affiliate campaigns. Below, we shed light on its core features and backend/frontend functionality. The Amasty Affiliate Magento 2 extension offers a very user-friendly registration procedure for Magento affiliates. 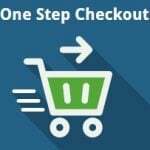 It is only necessary to complete two steps: to create a customer account on your e-commerce website, as well as to fill in an affiliate settings form. 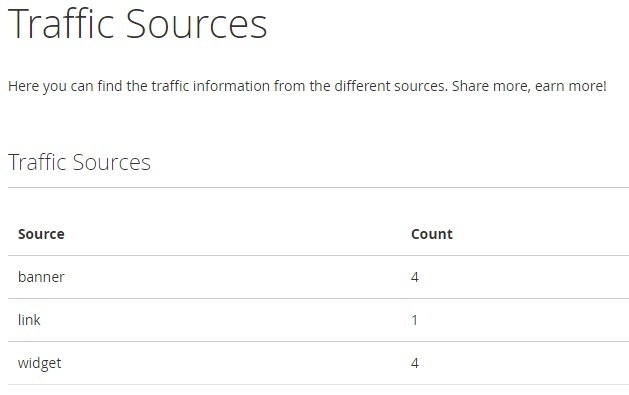 Next, your new partners will get access to various tools and informative stats. We describe the frontend appearance of this Magento 2 affiliate extension in more details in the appropriate section of this post. As for backend nuances, the module provides the ability to create multiple Magento affiliate programs with ease. Next, you can effectively manage them, since all programs are gathered in a grid. The Amasty Affiliate Magento 2 module not only provides flexible commission configuration but also allows applying lifetime sales commissions associating a particular customer with one affiliate. As for commission types, there are several ways to divide them into groups. First of all, you can fully leverage Pay per Sale and Pay per Profit commissions. Next, the Amasty Affiliate Magento 2 extension enables you to apply either fixed or percent commissions. Moreover, the module allows setting up unique commission values starting from the second order. Besides, you can manage affiliate accounts as well as create new ones from the backend section. 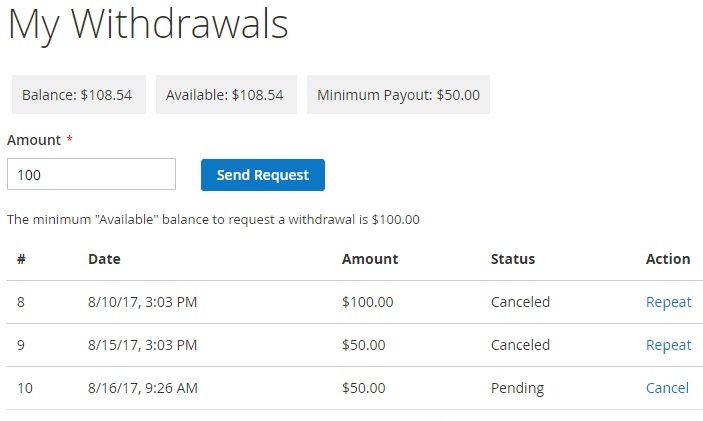 The admin panel displays payment stats, detailed reports on coupon usage, all transactions, as well as withdrawals. It is also possible to upload and manage banners from the backend. 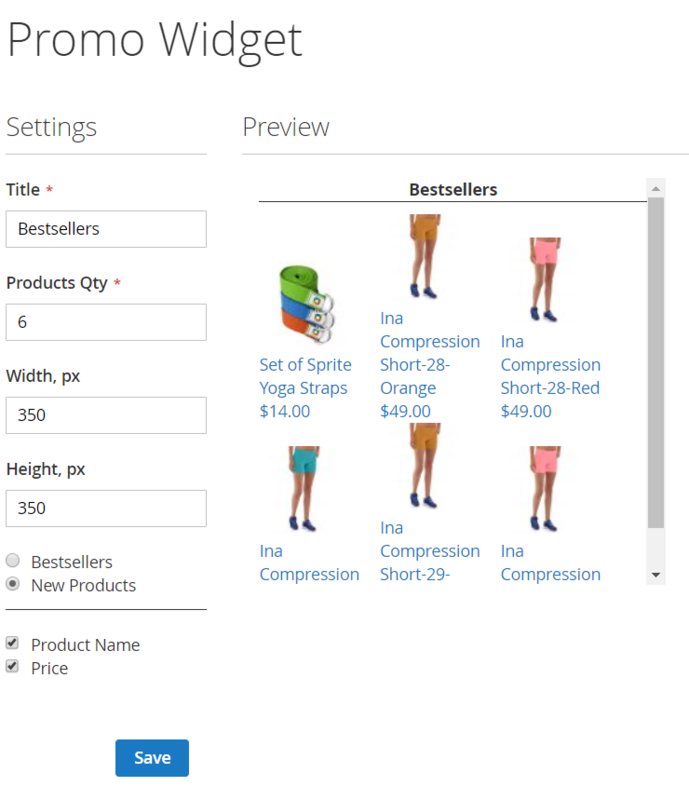 Two banner types provided by the Amasty Affiliate Magento 2 module are text and image. Note that referral links are provided for each banner type. To make the long story short, let’s proceed to the backend section exploration. As mentioned above, all Magento affiliate programs are gathered in a grid. The Amasty Affiliate Magento 2 extension displays relevant information for each program, like its name, commission type (per sale or profit), amount of commission (in percent or fixed) and commission from the second order, discount type and amount, total sales amount, and status. 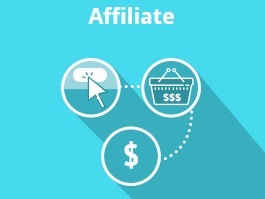 As for affiliate accounts, they are gathered in a grid as well. 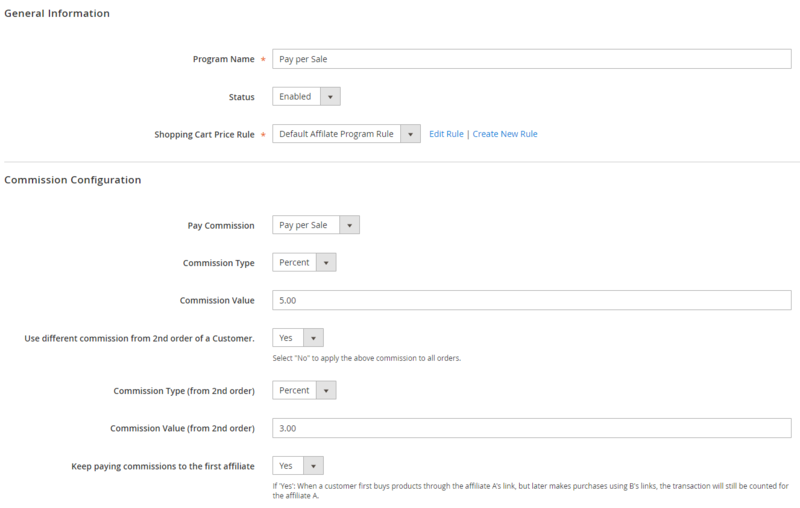 With the Magento 2 affiliate extension by Amasty, you can view an affiliate name, email, balance, amount of paid commission, total paid amount, status, and whether terms and conditions were accepted. As for banners, you can view all existing ones in the Affiliate Banners grid. 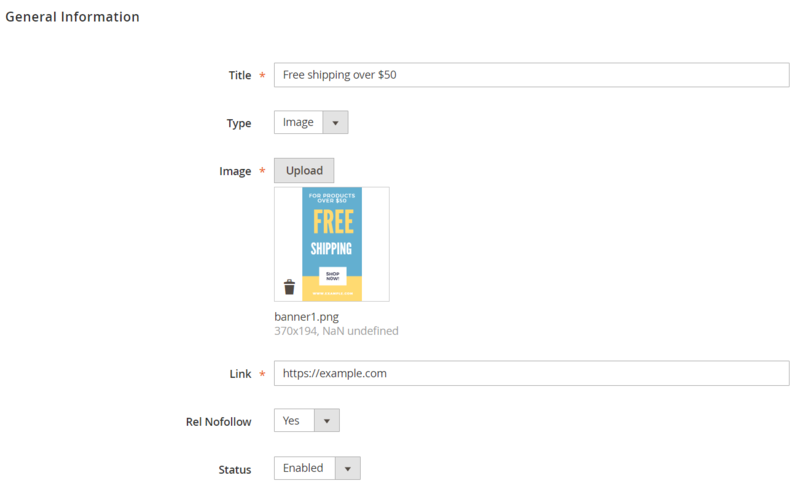 Promo banner management allows editing a banner title and type (image or text), uploading images, and managing various link parameters. 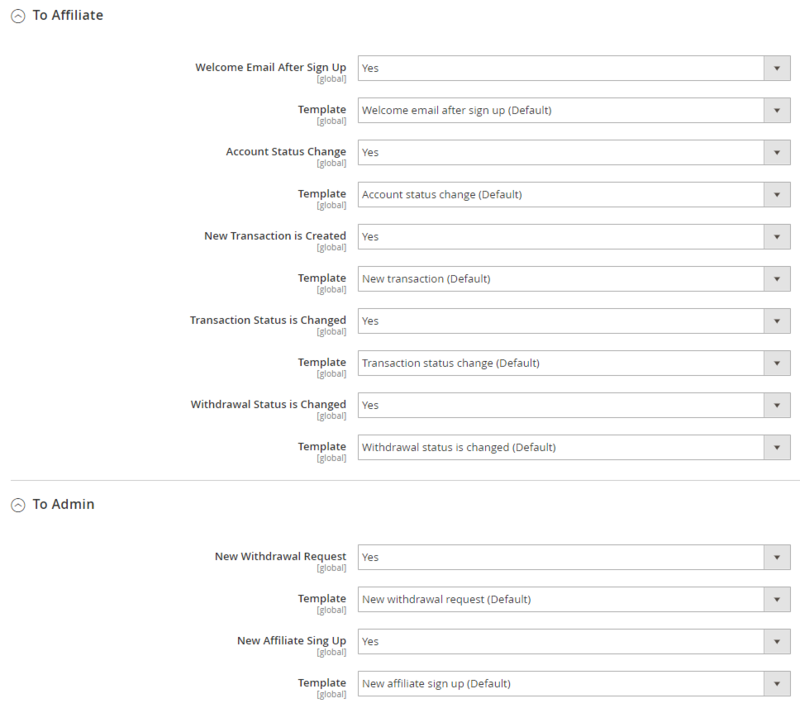 Next important backend element of the Amasty Magento 2 Affiliate module is a grid with affiliate transactions. 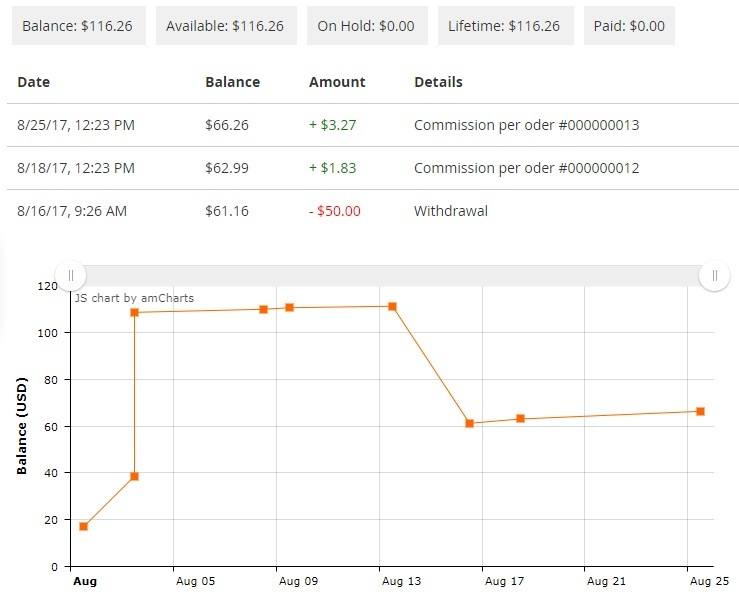 It displays a commission type, affiliate and customer email addresses, order ID and subtotal, amount of commission and discount, date of update, status, as well as a store view. It is also necessary to say a few words about the configuration section of the Amasty Affiliate Magento 2 module. 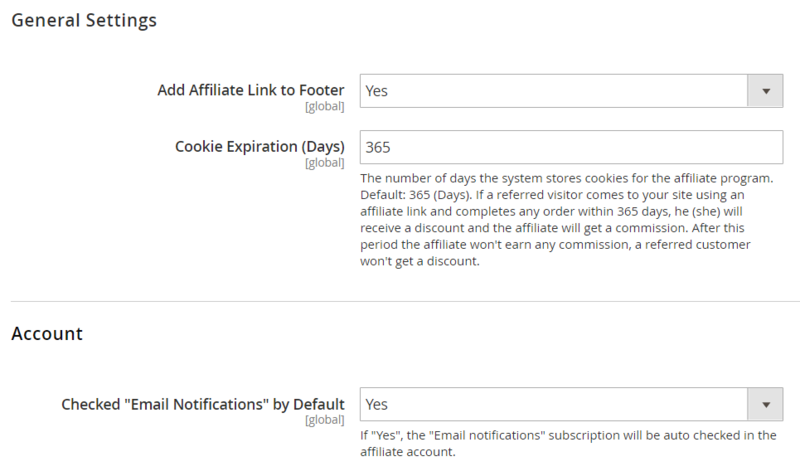 It allows adding an affiliate link to the footer, set the number of days cookies are stored for the affiliate program, and enable email notifications for affiliates by default. The configuration section also contains configurable affiliate URL parameters: affiliate code and its length and customer parameter. 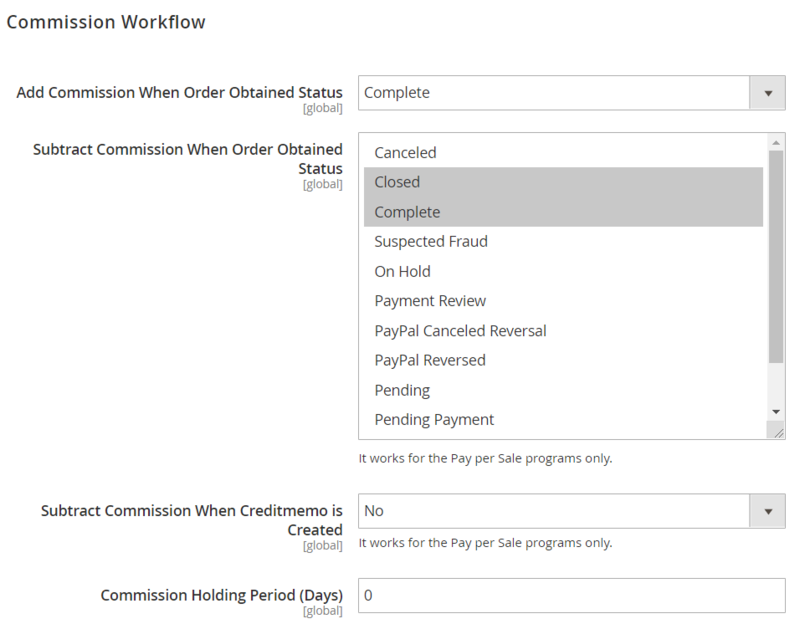 Commission workflow is editable as well: select an order status to add and subtract commissions, decide whether to subtract commission when a credit memo is created, and specify a holding period for commissions. In the Withdrawal Configuration section of the Magento 2 affiliate extension, specify minimum withdrawal amount and minimum balance for withdrawal request. 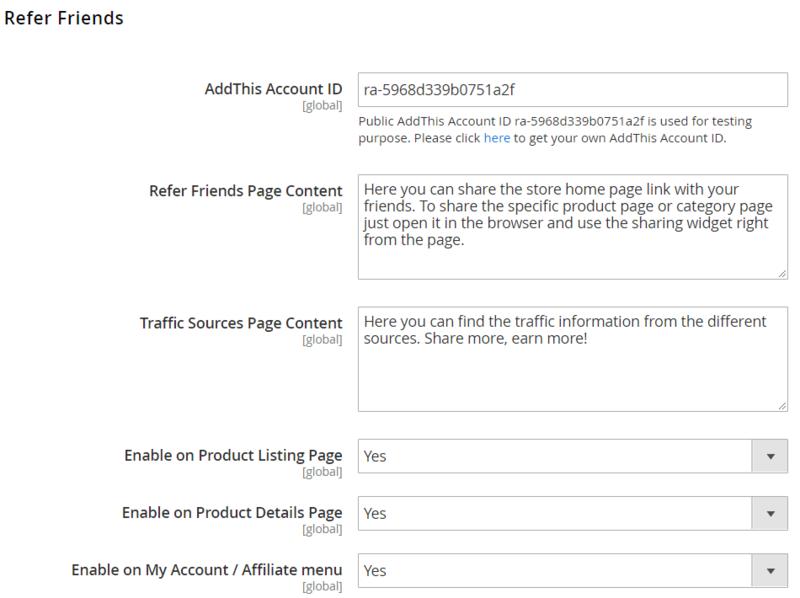 In Refer Friends, type your AddThis account ID, create descriptions for referring friends and traffic sources pages, and enable/disable the option on product listing and product details pages as well as affiliate menu. In Terms and Conditions, you can create text that will be displayed at the Terms and Conditions checkbox and make the checkbox checked by default. Now when you know how to configure and use the Magento 2 affiliate extension, let’s see options your affiliates have to deal with. A new block with tabs is added below the common account options. The Amasty Affiliate Magento 2 module provides 8 new sections: Affiliate Programs, My Balance, Promo Data, Promo Widget, Traffic Sources, Refer Friends, My Withdrawals, and Affiliate Settings. 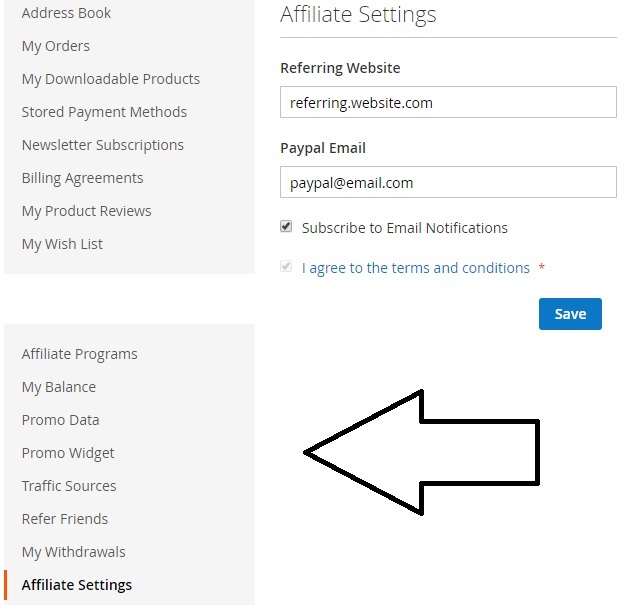 In Affiliate Settings of the Magento 2 affiliate extension, your partner can specify his or her referring website and PayPal email, enable/disable email notifications, and agree to the terms and conditions. 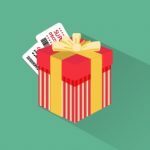 As for Promo Data, it is possible to get coupon codes for each affiliate program here, as well as create referral links for any store URLs and get banners. 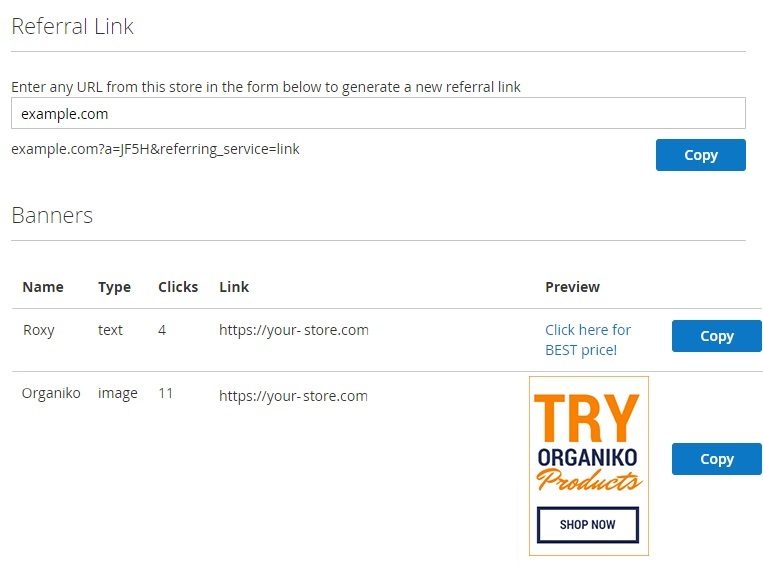 Also, note that registered affiliates can share various store pages in social networks with the help of corresponding social buttons via the Refer Friends tab. New: the setting that allows changing the affiliate URL was added.